Here is a recent update from Dan in Kenya. He met with Joel Mwangi this past week and was able to see what Joel’s Zidisha loan has done for him. Be sure to check out Joel’s profile page if you’re interested in learning more about him. Hello, my name is Dan Cembrola, one of Zidishas Kenya Client Relationship Managers. I am currently visiting Zidisha borrowers in Nakuru and its outskirts. I visited Joel at the place of one of his businesses in Bahati. It is evident that Joel is a natural community leader, and a well-respected one at that. His most idealistic long-term goals are eradicating poverty in Bahati. Toward that end, he has used his Zidisha loan to expand his farm and invested in higher quality fertilizer and seeds to ensure that his crops will be healthy and bountiful. Joel strongly advocates the use of high quality seeds and fertilizer to his neighboring farmers. He evidenced his point clearly as he gave me a tour of his village, pointing out which farms were able to afford fertilizer and quality seeds. In an effort to advance his community, Joel is selling a portion of his land that he has tilled and prepared for the next growing season to a neighbor. His intent is to give his neighbor an opportunity to begin a small farming business to help support his family. Joel regularly advises members of his community on improving their fertilization and irrigation practices. 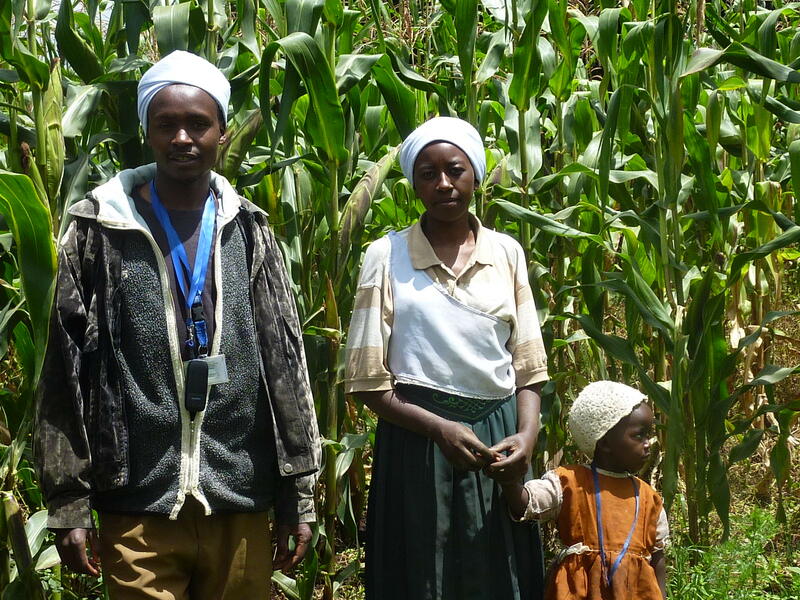 With the now abundant crops Joel is growing with his loan from Zidisha he has been able to employ laborers in Bahati to assist him and his wife during the harvest season. In addition to operating a three and a half acre farm, Joel also serves as chairman of the group of motorbike operators in the region. In the past few years, there has been a rise in the incidence of common thievery in Bahati, many crimes were committed with the aid of motorbike drivers. With the assistance of the local police force and the support of his fellow motorbike drivers, Joel was elected chairman of the group. As chairman, Joel has instituted a policy that mandates that every motorbike driver must have a registered identification card which is displayed to all of their customers. This measure has provided a sense of accountability to the motorbike operators and allows their customers to be confident that each driver is registered and approved by the local government and police department.